Although each Tiki Bar is configured with the options selected, we have a sufficient stock so that your Tiki Bar is ready for shipment, pick-up or delivery within a few days of placing your order. Your Tiki Bar will be packaged in a wood shipping crate. Each component comes fully assembled with the exception of slipping two sections of the PVC frame together before the first use. We ship via UPS ground and delivery time will range from 2 to 6 days determined by your location from central New Jersey. Please note there is a $50 crating fee for any Tiki Bar purchase. Crates are custom built per order and ensure your Tiki Bar arrives in good shape. 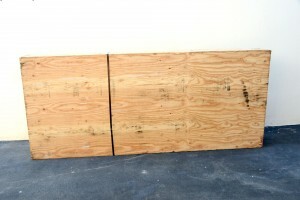 The crate measures 74″ x 32″ x 8″, weighs 145 lbs and is subject to UPS large package surcharges. The crate is re-usable should you need to ship it again, say to a trade show in another state. Please let us know if you intend to re-use it so we can make some adjustments to the crate for you. Expedited shipping is available at an additional cost – Contact us for more information. Orders for more than 3 units can be shipped via truck freight common carrier at a reduced per unit cost. Our other products are custom made to order. Crating and shipping charges will be calculated at the time of placing an order as most will be shipped by common carrier truck freight. TikiBarToGo.com will deliver your bar in parts of New Jersey and Pennsylvania. Our delivery charges are often less than the crating and UPS shipping charge. Call for a delivery price quote. You can also pick-up your order at our shop in Burlington, NJ and save the crating and shipping charges, but, we must add New Jersey sales tax.